It’s been a while since we heard from Alan Bennett. I am disturbed to find Melvyn Bragg working in the hotel as a doorman. He pretends not to recognise me. To Massenet’s Werther at the Bolshoi. It is an indifferent production, the scenery and sets almost Music Hall, but the house is packed and Nina and Galina, our guides, say that this is the first time for years they have managed to get a ticket, which makes us all feel worse for not enjoying it. Someone who is enjoying it is Melvyn Bragg, this time in the back row of the chorus. Another visit to the Bolshoi, this time for an evening of ballet excerpts. […] By now I am unsurprised to find Melvyn is in the ballet as well as the opera, and he even takes a curtain call, accompanied, as ballet calls are the world over, by a deadly hail of tulips. This is brilliantly observed, working perfectly for our images both of Bragg and of the various scenarios in which he appears. 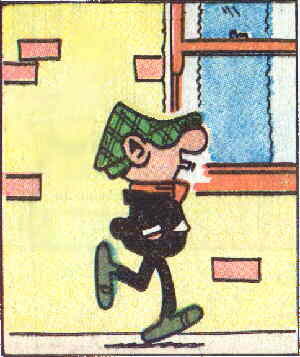 Talking of lookalikes, à la Private eye, my friend Hugh observes that Li Manshan is a dead ringer for Andy Capp. Might they perhaps be related? I think we should be told. This entry was posted in drôlerie, Li family and tagged Bennett. Bookmark the permalink.